Gossip Stone: Should Link Have Parents Present in a Game? In the Legend of Zelda series there is no emphasis on Link having any parental influence in any of the games. 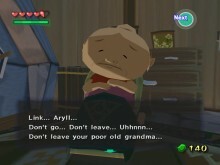 The closest we get is in The Wind Waker where Link has a Grandmother who happens to make a very nice bottle of soup. With that in mind should the series have a game where Link’s parents make an appearance? Click the jump to join the discussion. First let’s look at Nintendo’s history of adventure games with parents as a whole. In Pokemon you have a mother in every game but, beyond directing you to the professor to get your first Pokemon, at most she has a few lines in the game that amount to her asking how you’re doing. In Fire Emblem there are plenty of games that feature one or both parents; however, most of the time they are either already dead or die early on in the game and are used as a motivation for your main character. Then you have Golden Sun which features parents that send you off on an adventure, but at least in Golden Sun: Dark Dawn they fight by your side for a mission. So looking at how Nintendo features parents in games it’s either limited or none at all. So with Nintendo’s use of parents in mind I actually think Nintendo should feature Link’s parents for one game. The reason is that I think it could add a darker tone in Link’s character as one motivated by a personal loss rather than a crisis. It could add some interesting elements to the game; however, I do not want parents to be featured as a regular thing in the series as a whole because with Nintendo having limited uses for parents in games they really won’t add enough significance to make multiple appearances. So what do you think? Should the series feature parents for Link? Let us know in the comments below.